Our Dump Truck comes with an experienced driver! When the "load" needs to be dumped, the bed tips on a hinge and the tail gate flips open at the same time. 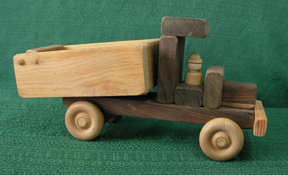 As part of our Construction Truck set, this handmade toy Dump Truck (made of oak, walnut and maple with a natural oiled finish) is sturdy enough for the heaviest of loads. It can haul away anything the Bulldozer or Crane Truck can pile up. If you would like a toy truck that does not have a lot of pieces, moves with ease and has a classic look, our Dump Truck is it! Be sure and choose your fininsh in our Option Box when you order. The oiled finish is Watco oil - child safe. By chosing "Natural" there will be no finish applied. Click TOY FINISHES for more information on our finishes.